Time for the monthly wish list! This month I've tried to include some things that are a little more affordable than some of my previous ones, just because it means my wish list is more likely to come true!! Desert Essence Coconut Shampoo (£8.99): I've tried a few samples of some of the other Desert Essence shampoos before and really liked them. I need a new moisturising shampoo and this coconut one is specifically for nourishing dry hair so I'm pretty sure I'll be getting this one. Hurraw! Lemon Lip Balm (£3.45): As a bit of a lip balm addict I'm always wanting to have more in my collection and I've not tried Hurraw! before. They have a lot of different options to choose from but I love the sound of the Lemon lip balm as I don't have anything like it already. 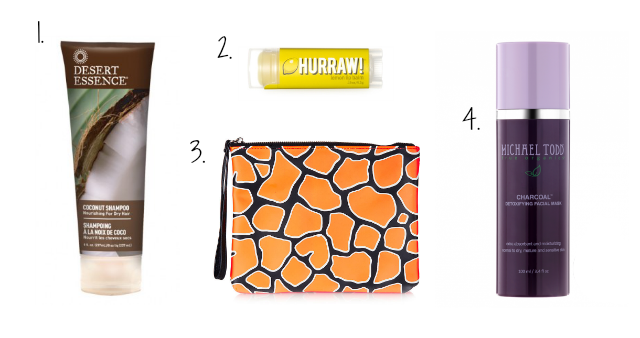 Topshop Giraffe Print Make Up Bag (£12.00): I haven't bought a new make up bag is sooo long so I think I'll treat myself to a new one soon. I'm not usually a fan of animal prints but I love this giraffe print. Plus it's orange which is one of my favourite colours! Michael Todd Charcoal Detoxifying Mask ($34.00/approx. £21.00): I've reviewed this before and mentioned it recently in my "September Loves". It's been working wonders clearing up my skin! I only have a travel sized tube of this at the moment and there's only enough for one or two more uses now so getting the full size is a must for me this month, even if it is a little on the pricey side! I still haven't tried any Michael Todd products but really want to! That make up bag is so cute and unique. You'll love the Michael Todd mask! I love all of the products I have tried so far. I'm a really big fan of all of their charcoal products. Love the bag too! Great list! That makeup bag is so adorable!